It’s that time of year: tryout time! Whether this is your first time trying out or your tenth, it’s completely normal to have some nerves. 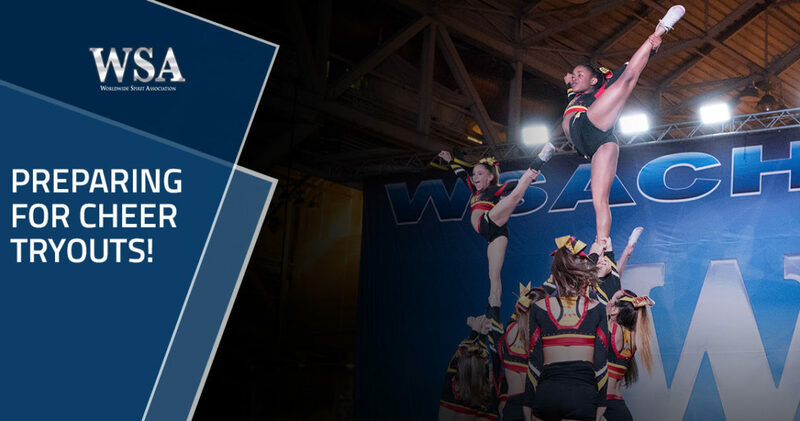 For many all-star cheerleaders, tryouts are their chance to show off what they have perfected over the season and possibly move up a level as a result of their hard work. Here are some of the top things we encourage you to keep in mind when it’s time for your tryout. Yes, we know this is much easier said than done. However, do your best to let go of whatever is holding you back. If you have your back tuck, but you’re scared to throw it, ask your coach for their opinion. If they know you can throw it with proper warm up, then don’t be afraid. On the other hand, if you threw it by yourself for the first time a few days ago, then maybe it isn’t quite ready for tryouts. Do whatever you need to in order to overcome your fear and feel confident when trying out. Tryouts aren’t the time to be shy. This is your time to put forth as much energy and excitement as you can. Think about it — cheer coaches want energy, facials, and sharpness in their athletes. If you can’t bring that during tryouts, how are you supposed to deliver when it comes to competitions and performances? Start practicing your dances and motions with ridiculous facials in the mirror. The more confident you are, the more likely you are to dazzle the judges and coaches. Some athletes are going to be better, others are going to be newer. Regardless, no one starts off a sport by being the best. Focus on yourself and what you can do in order to succeed; don’t waste your energy by watching the girl next to you. You are talented and skilled in your own right. It’s now your responsibility to show the judges that you have what it takes. One of the best ways to feel ready for tryouts — whether they be for cheerleading or any other select team — is to visualize yourself doing what you need to do. Go through every count in your head, eyes closed, and imagine yourself executing everything precisely. Don’t forget to imagine facials, too! Studies have shown that athletes who visualize before a big game, performance, or tryouts tend to perform with more confidence than those who do not. In cheerleading, confidence is the name of the game, so don’t forget to visualize. We at WSA Cheer would like to wish all the all-star cheerleaders out there good luck with their tryouts! We know you’ll make new friends this season and learn more about cheer than you’ve ever known before. Our crew looks forward to seeing you at your next national cheerleading competition. Be sure to take a look at our schedule for next season and see when we’ll be stopping by a city near you.